Reservations suggested. On this 3-4 hour flat-water paddle, you can spend a leisurely morning or afternoon on the Columbia River exploring the local waterways, taking in the spectacular scenery and enjoying lunch or snacks on a sandbar or the shoreline along the way. The Columbia River Wetlands provide habitat for more than 250 species of birds: eagles, osprey and herons are commonly sighted throughout the year, as well as various species of wildlife. You’ll be required to sign a waiver on check-in. 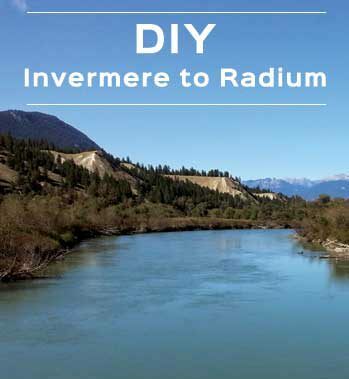 Mid-June to Labour Day weekend: Pickup times in Radium are 1:00 pm, 3:00 pm and 5:00 pm. May-June and Sept.-Oct.: Pickup time in Radium is 4:00 pm. Start times are usually 3-4 hours before the booked pickup time. Please book by PICKUP TIME. *Pricing includes shuttle service for the standard occupancy of the chosen Boat. Canoes can add more than the basic two seats for shuttle cost only.